Ah Ebay. Over the last few years, it has been a mixed bag for me; Great for buying, not so much for selling since the recession started. Between seller fees, PayPal fees and no one having any money, it is not uncommon for me to break even or take a small loss on items I have listed there. With cramped working space, I look around and realize the need for space takes precedent over the need to hoard. I keep my impulse buys to small, unusual items that are under $40.00. Generally that keeps me out of trouble! 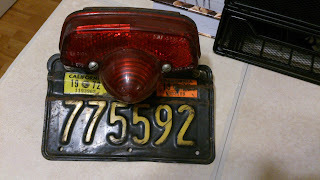 This interesting early 60's Lucas Tail light found me for nice price a couple weeks back. I am not certain what model it came off of or even which make, but it has a neat look which may suit my T140 Tiger project (more on that in future posts). The package came from San Jose, wrapped in newspaper from the midlands....! 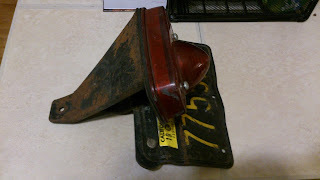 It is very rough, (the seller might have mentioned the small cracks near the mounting points) However a sandblasting session, a small weld and powder coat will make it better than new! 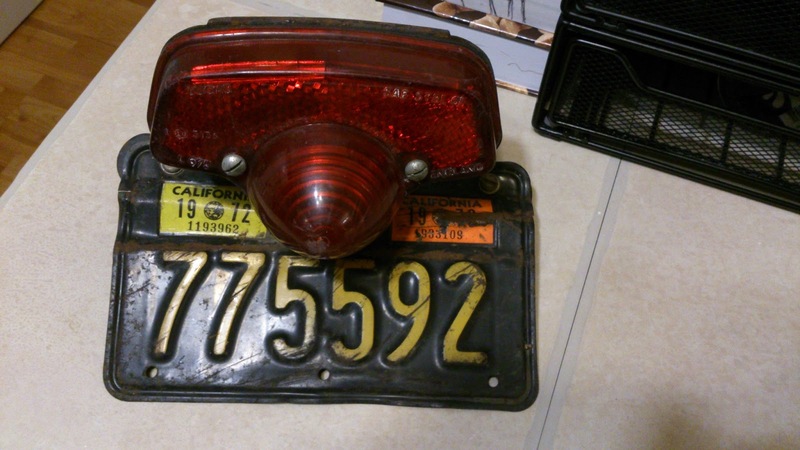 The added bonus for me was the vintage California plate. For some reason I have always wanted to have one. I tend to associate vintage bikes with either Sunny Southern California or damp swinging 60's England. It's a shame I can't ever actually use it on anything, it would add an excellent period Steve McQueen vibe to any project. My plan is to straighten it up, clean it and use it just for photo shoots.